Of course, I have no idea what he was banging on about, but I am unreliably informed that he may have been in the plastic wrapped lettuce section of Coles at the time, and would have been better off at the Lunatic Soup Lounge last Sunday, where the good, the average and the delusional neatly collided at around 4.39pm. for a splendid little session de jam. But I digress. The Jam Session, yes, it is all coming back to me now..Jam Sessions thrive on improvisation, coupled with desperation, inspiration and a good slap of mistakes. And last Sunday’s was one such, it would seem, The arvo kicked of with a set from Gentleman John Curtis, purveyor of fine toons to the gentry, with Noel and the Captain on saxophones, and I can’t quite remember who else. Two new drummers turned up – Steve, all the way from Euro, and Mike both on the money, the Debster got up and sang, with Bob on piano, then Katerina Myskova put in a coupla fine numbers, the Hirsh on drums, Mr Lole amusing himself at the eight ball table and getting up later, Colonel T I think, Ivan the terrible, Chrissie and Bruce and a bunch of others, before I left – the final tally stood at 22 musicians, all marvellously talented, young good looking and in most cases delusional. And imrpovisation, or omparvosition as it is sometimes called? Well, if you can tell the difference between that and a muso just being plain lost, then don’t – you would be wasting your time in this fine company. Or just make it up as you go along. The aforementioned Gentleman John C will be wafting the conductor’s baton, so turn up, tune up, pin back yer lugholes and get on down. Ya wouldn’t be dead fer quids. Yep, she knows all the words… Accompanied by Mr Hirsh esq. on drums, Kip Dale on bass and meself on piano trying to keep up. 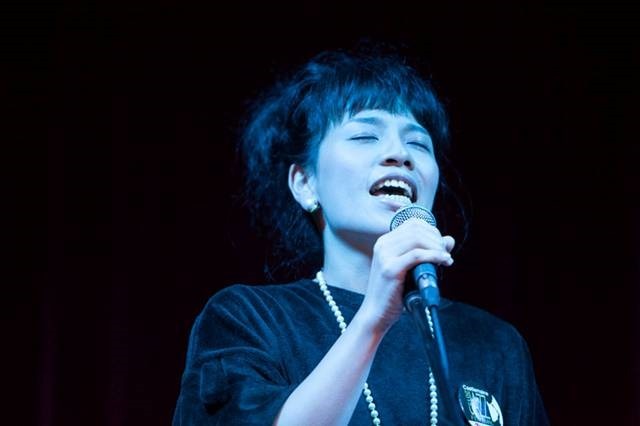 Jazz at a frenetic pace is Risa’s forte, well tempered with some delightful ballads, and obscure (to most of us) Japanese toons thrown in for good measure. This should be a good night, and the audience at Laika continues to grow. As it should, given the hot little set by Sevil last week, and Katerina the week before. If you fancy a stroll down the beach end of Fitzroy Street St Kilda, and the weather is warm, drop in for a cocktail or a glass of vino. Steve at the door will welcome you in. For an extra five bucks, he will even ask for your ID. Summer. Jazz. Cocktails. All good. Risa Khodani with the B Team, from 8.00pm Friday 30th October at The Laika Bar, 9 Fitzroy Street, St Kilda. Seems like we have a few starters – the Sevil Sabah Quartet will play a set at the Bull’s Head, always assuming we can stagger from the Faithfull Street stage in time on Saturday, Chelsea Allen will slap the skins , and the sublime Ade Ish is rumoured to be dropping by – as well as the regulars, all marshalled by the inimitable Captain Chaos (70 and a bit) himself. Or buy a ticket and hear some real music…. The Captain Chaos Birthday Bash started in a hurry, and just kept getting busier and busier. It was the biggest Jam session on record. Only we didn’t record it, which is possibly a good thing. We passed the previous record just before 7 o’ clock, when jammer No 34 got up to croon Happy Birthday to the Captain – Brigid De Neefe leading a massed choir of the Debster, Maria, Mme Sonia, Chrissie, Rachel, Kerrie, Lisette (possibly) and Julie. Croon is possibly an inapt description of the rendition, but it sent the Captain off to a fine dinner with relatives, friends, and jammers in the Atrium. …the quality was up there with the best. You will have to go back and read that sentence again. Katerina sang a blisteringly good set, to a larger crowd than usual, and this week Sevil is back for a fine tune before her set at Wangaratta. Sevil will be singing some new material, accompanied by Ben “Twang”Stewart on guitar, Doug “Haircut” Kuhn on bass and meself on piano. Oh, and Chelsea Allen on drums. The girls both have class, and the rest of us will be relying on chutzpah. Was well attended by all accounts, with a lot of peeps on the street enjoying some fine music, food and wine, and the weather was more than generous. I will catch up with Peter Guest once he has slept it off, but the hope is that this will become an annual Festival. Plans are afoot for a March Festival – an lot of planning to be done before then, and the Jammers have been asked to host a Jam Session. The Captain has arranged three sessions at the Bull’s Head, and we will be playing a coupla other places as well… Jammers are invited to swing on by if you fancy a dip. We’re looking for singers and instrumentalists to be showcased, backed by the house band or playing as a solo or duo. You can book a spot before the event or just turn up on the night and take your chances. There are also a couple of open jams – no need to book. Eltham: The first Soirée Musique in Eltham was a big night with about 80 people in the audience. Great venue, too. Our next Soirée at Eltham is on Friday 13 November, 7:30-11:45pm at the Eira Café Lounge Bar, 1 Pryor Street, Eltham. Northcote: And Soirée Musique in Northcote continues – the next one is on Friday 30 October, 7:30-11:45 at the Ember Lounge, 111 High St, Northcote. We have many regulars who never sing or play: they enjoy the night as the audience!